A video that shows the men stuffing the terrified 29-year-old into a coffin spread like wildfire on social media. 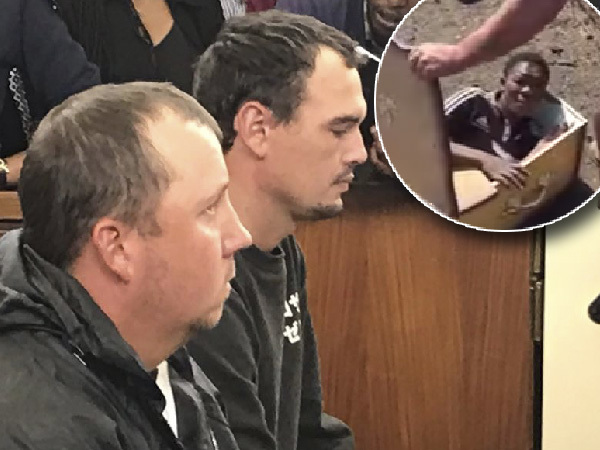 The two men accused of violently stuffing a black man into a coffin abandoned their bail application, citing security concerns. Willem Oosthuizen (28) and Theo Martins Jackson (29) of Middelburg, Mpumalanga, appeared in the local magistrate court in the midst of a heavy police presence on charges of assault with the intent to cause grievous bodily harm. 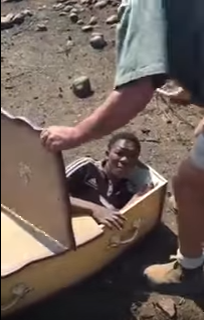 A video clip, which shows them attacking a terrified Victor Rethabile Mlotshwa (29) and stuffing him into a coffin, has spread like wildfire on social media. Legal experts say that even though although the two men didn’t really bury Victor, they most certainly intended to. A screengrab from the shocking video, which has since been removed from YouTube. Professor Marinus Wiechers, constitutional law expert and former head of Unisa, says that what you see in the video is a serious attack on Victor’s human rights. Victor says that the two men were attacked after accusing him of trespassing on their property. After the two men were taken into custody the EFF released a statement which described the statement as a “this humiliation can be based on nothing else but his blackness” and stated that they viewed the attack as racially motivated. The video was criticized by people of all races. The attack apparently took place on the JM de Beer farm close to the Komati power station, although the exact time and date of the incident is unknown. Gen. Leonard Hlathi, provincial spokesperson, confirmed that the men had turned themselves in at the Blinkwater police station on Monday. The case has been postponed until 25 January pending further investigation.